Who said that a monster couldn’t be adorable? 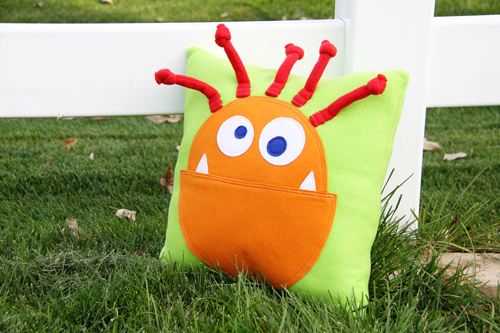 This soft cuddly pillow sports a friendly monster face you can’t help but love and it’s just the right size for kids to hug. Plus it’s easy to make so it won’t turn into a monster project . . . so why make only one? 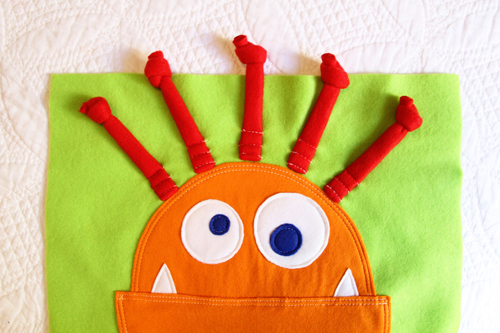 Friendly monsters are welcome in your little one’s room and in the car. 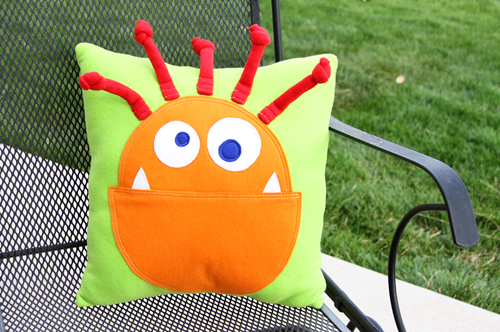 This monster pillow is also a great gift idea for your little one’s pals, too. Step 1) Cut out the pieces. 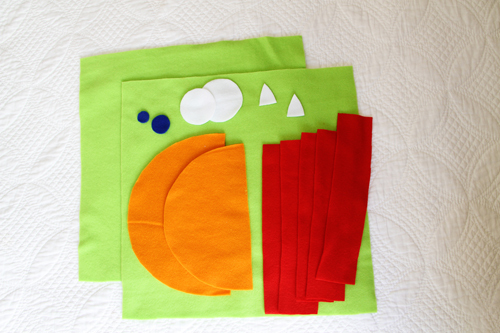 Cut out all the pattern pieces in the colors of your choice, using fleece or other non-fray fabric. 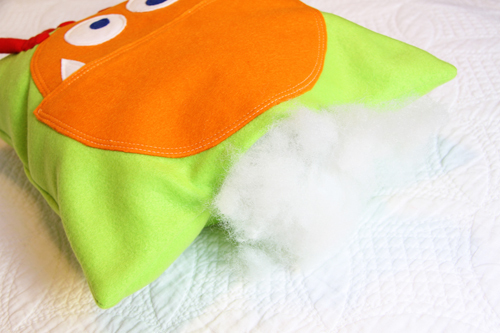 Step 2) Fuse and stitch the monster pieces to the pillow. 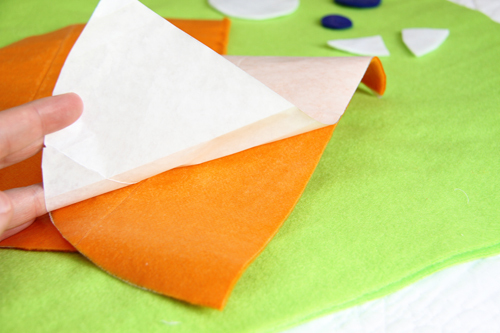 Apply the fusible web to the back of the corresponding pieces following the instructions on the fusible web package. Peel away the paper backing (if your webbing has backing) from each piece. 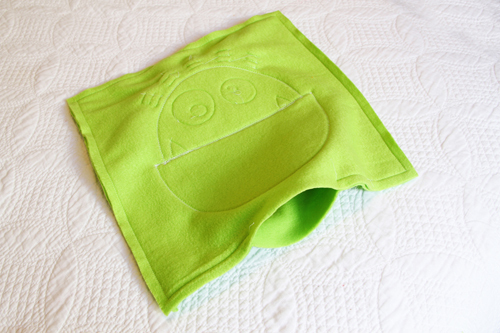 Place the Head Top, adhesive side down, on the front of one of the Pillow Base pieces, 3-1/2″ from the top and centered evenly from left to right. Fuse in place following the instructions on the package and making sure the adhesive has adhered. 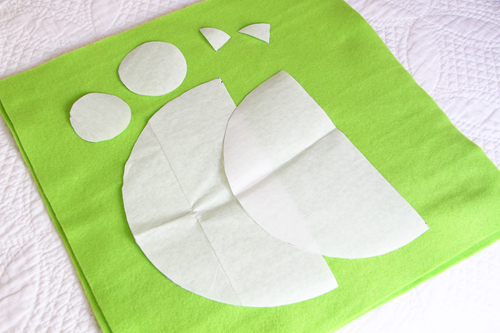 Place Outer Eyes and Teeth inside the dotted lines (see pattern piece) and fuse in place. Repeat for the Inner Eyes. 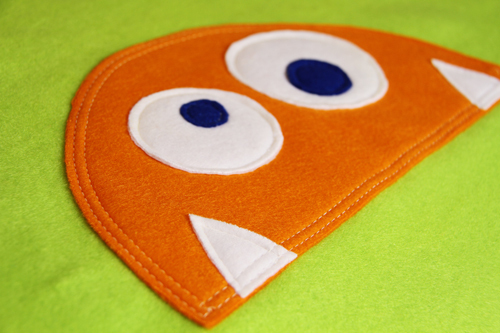 Sew around the edges of each piece, 1/8″ from the outer edge. 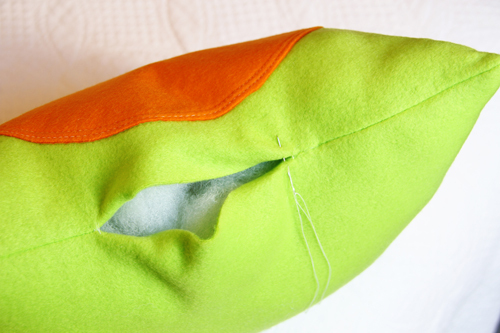 Sew another line of stitching around the Head Top piece, 1/4″ from the edge. 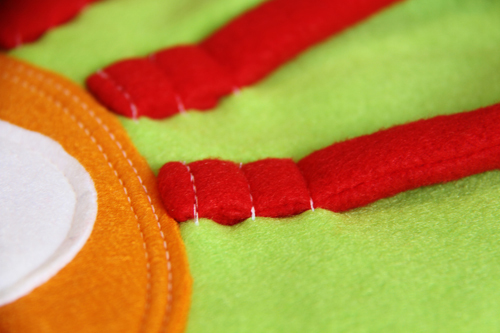 Alternatively, use a Double needle or Twin needle to achieve a nice, even double-stitched line around the Head Top. Overlap the top edge of the Head Bottom 1/2″ above the bottom edge of the Head Top, centered evenly from left to right. Fuse it in iplace, making sure the adhesive has secured it in place. 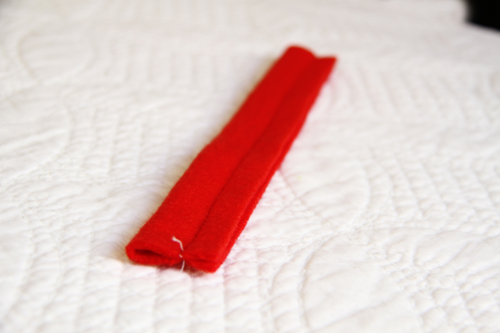 Sew two lines around the outer edge of the Head Bottom, 1/8″ and 1/4″ from the edge (or use a Double or Twin needle), just like the stitching around the Head Top. Step 3) Make and add the monster hair. Fold each Hair Strip in half lengthwise, with right sides together. 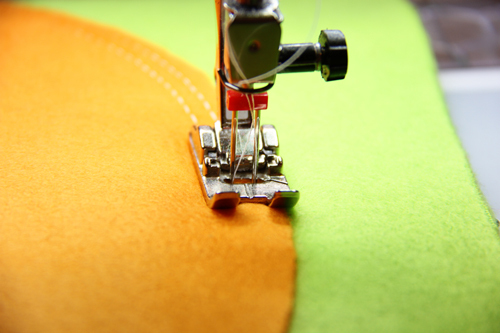 Stitch along the long edge with a 1/2″-wide seam allowance, making a tube. Turn each tube right side out. Note: Don’t trim the seam allowances; leave them at 1/2″ so they act as “stuffing” for the tubes. Tie a single knot at the end of each strip. Take one of the Hair Strip pieces and hold the unknotted end in your hand. Fold the end under 1″ and then place this folded end at the very top of the Head Top, with the extra 1″ folded under and facing down. Be sure that this first Hair Strip is centered evenly in the middle of the Head Top and the bottom of the fold meets evenly with the top edge. Sew the Hair Strip in place with three lines of stitching spaced 1/2″ apart, with the first starting right at the base of the strip. Using the first Hair Strip as a guide, add the other four strips, placing them 1″ apart. As you line up each Hair Strip perpendicular to the top edge of the Head Top, they will automatically fan outward. 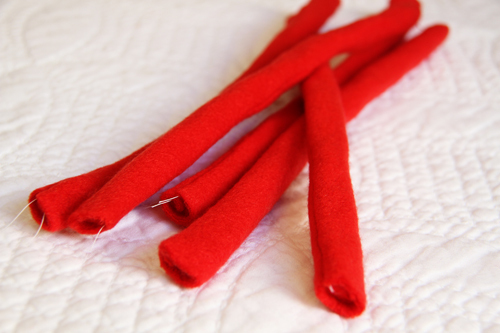 As you sew each Hair Strip in place, be sure that the extra 1″ folded underneath is hidden. 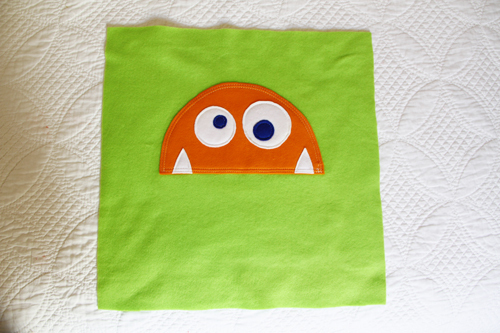 Step 4) Construct the Monster Pillow. Place the two Pillow Base pieces right sides together, taking care that the Hair Strips are folded toward the center and out of the way. Pin them if needed. 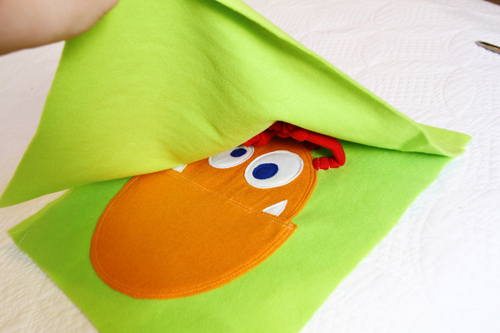 Sew around all four sides of the pillow using a 1/2″-wide seam allowance and leaving about a 6″ opening along the bottom edge. Trim all four corners as shown. Turn the pillow right side out, poke out the corners, and stuff with batting. 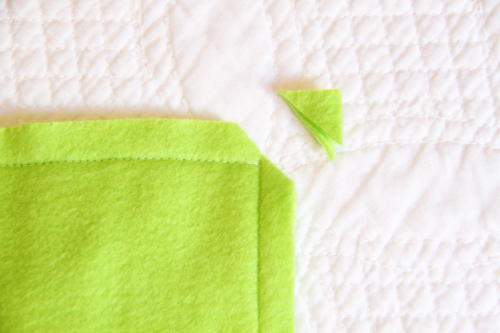 Fold the raw edges of the opening under 1/2″. Hand-sew the opening closed. such a cute project. How can I get instructions? I am making this pillow. Love it! But I cannot get my hair pieces to turn inside out. Been working on one for an hour. Any suggestions? thank you.